Our son is four years old and has food allergies to dairy, soy, egg, peanut, tree nut, legumes, green pea, and hemp. For the past couple of months he would occasionally cough up food while eating. I just assumed he wasn’t chewing enough and was in a rush to eat. But it continued to get worse. Through Facebook and my blog, I have met other allergy Mom’s. I have been lucky enough to share stories and information with these women. It is because of these relationships that I learned about EoE Eosinophilic Esophagitis. 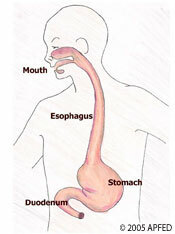 It is a disease that effects the esophagus, usually caused by food allergies. As I read more about the disease, it occurred to me that it could be the reason as to why food kept getting stuck in our son’s throat. Not long after researching about EoE, he stopped eating his favorite food, bacon. In the three years that he’s been eating bacon he has never, ever refused a piece. Then he also started refusing other foods. I knew he was hungry. He would attempt to eat, but couldn’t swallow. He would sit there with a mouth full of food all chewed up, and just cry. He would cry because he was hungry but he couldn’t swallow. It was enough to break my heart. I made an appointment with his pediatrician who then referred us to a GI doctor. The GI doctor explained to us about Eosinophilic Esophagitis and ordered some tests to confirm. Today he had an upper GI done. He swallowed liquid barium while they took x-rays of his esophagus, stomach, and upper intestines. He did a wonderful job!!! We hope to hear results from the doctor within 24-48 hours. The GI doctor also scheduled an endoscopy in two months. For this procedure they will put him under anesthesia while they collect biopsies of his esophagus. The biopsies are then examined to look for large amounts of eosiniphilits. This will determine whether or not he has EoE. In the meantime, getting enough calories into him has been somewhat of a challenge. Because of his allergies, it’s already difficult for him to gain weight. I’m doing everything I possibly can to prevent him from losing weight. However, his inability to swallow solid foods makes it even more challenging. The one thing our son hasn’t been refusing are shakes. I make a big batch each morning using banana, strawberries, peach, baby food, rice protein powder, flax seed oil, rice milk, and/or orange juice. One batch contains over 1,500 calories, 42 grams of fat, and 24 grams of protein. Even though he isn’t able to swallow solid foods, I still feel pretty good with his caloric/fat/protein intake. Who knows…he may even gain weight! I am new to your blog but will enjoy your updates. We are in the same boat. My daughter turns 5 next month and will also have her biopsies next month for probable EoE along with her arsenal of similar allergies. Knowing noone else on this journey, I will "enjoy" reading about yours. Best of luck to your family. Thank you. Please keep me updated on your daughters health. I find that I get more information that helps my family, from other families going through similar situations. it does some easier knowing we're not alone. We are in the same boat too. My son is 2 years old and he is going to have his biopsy for EOE done in a month. We are struggling to get him to eat and when he does he gags a lot and spits the food out. So frustrating for him and for us and it makes me sad. I am going to try your shake idea I am sure he won't pass that up. Thanks for sharing and good luck!